Late rent is something every landlord deals with at some point. Unfortunately, it simply goes along with the territory. On one hand, if is one time incident involving a good long-term tenant who needs a few more days, most landlords are happy to accommodate. On the other hand, when it comes to a tenant who consistently pays rent after the due date, knowing what to do is important. When tenants fail to pay rent on time, many landlords feel like their only option is eviction. Although this may be true in specific situations, there are still ways to encourage tenants to pay their rent on time. By adopting a few proactive measures, you can take back control of your bottom line. With this in mind, we offer some insight on collecting the rent and getting paid on time. Managing rental properties in San Diego can be a profitable business. But only if you manage, your cash flow and collect the rent on time. In fact, the biggest factor impacting your cash flow is your ability to collect the rent on time. While you may think the cost of a late rent payment is limited to a simple nuisance. The price tag goes well beyond the initial delay in payment. To put things into perspective, consider the amount of time it takes to collect past due rent. From a monetary standpoint, late rent costs because it affects your cash flow. Late rent also erodes trust and forces you to be the villain. Is Late Rent Really A Problem? From sending a late rent notice to making calls to inquire about money. No landlord or anyone in business for that matter should have to ask for money when it is due! Finally, when it comes to a tenant who always pays the rent late. Just remember, bad habits are hard to break. For this reason, you must take a proactive approach to collecting the rent on time. The objective of owning a rental property or two is to make money. But, you can only make money when your tenants pay rent. There are several things you can do as a landlord to prevent late rent payments. When tenants fail to pay their rent on time, most landlords think their only course of action is to evict those tenants. Whilst it is an option, it should only be used as a last resort. That’s because the process itself is both time consuming and costly. In fact, for a formal eviction it can cost up to $5,000 or more (lost rent, lawyer, court costs, sheriff, locksmith, repairs, cleaning). 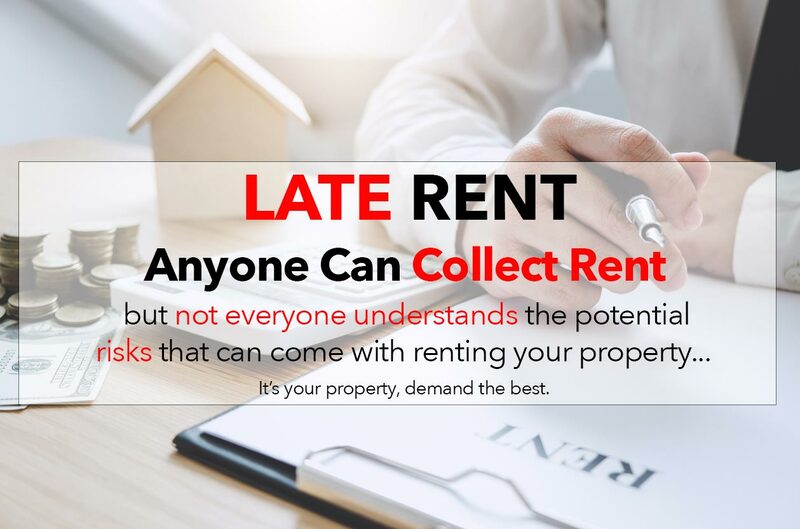 For this reason, it’s important to screen tenants, create incentives, add convenience, be consistent, and avoid leniency. By taking a proactive approach to rent collection, you encourage tenants to pay rent on time. As a client of Rancho Mesa Properties, your tenants can pay their rent and even submit maintenance requests online! It’s fast, easy, and secure. Below, you’ll find some information on the benefits of our online tenant portal. Screening tenants properly can mean the difference between having a tenant who will pay their rent, or one that will not. The fact is any prospective tenant can act like the best tenant in the world during the initial walk-through. But if you want to make sure, you are getting the best one, screen every prospective tenant thoroughly before they sign a lease! The modern renter relies on technology to stay on budget and on schedule. Having the ability to make rent payments from the road (without worrying about old school paper checks) is the new norm. By moving the rent payment process online, you save time, reduce your labor costs, thus improving your cash flow consistency. Communication is key in all aspects of being a landlord. Particularly when it comes to rent payments. So, make sure you are clear about when rent is due. Additionally, you should outline any fees or other consequences for paying the rent late. In addition to communicating when rent is due, you should also talk to your tenants when they are not paying rent on time. By taking the time to talk to your tenants, you can find a way to ensure on time rent payments. An example of this would be setting up an autopay for a date and a frequency that suits your tenant. Once autopay is set up, your tenants no longer need to worry about remembering to pay the rent every month. Saving you from having to chase them for late rent payments. It’s a win-win situation for everyone. As harsh as it may sound, you must be prepared to report past-due tenants to the credit agencies. Have you ever dealt with late rent payments? The process of collecting past due rent can be a nightmare. So, why not hire a property management company to do the work for you? Deciding to utilize a property management company can take a lot of the stress out of owning a rental property. At Rancho Mesa Properties, we are willing to go above and beyond to ensure your satisfaction and that of your tenants. So, whether you are interested in changing property managers, or simply looking to hire a property management company for the first time, we can help. We take manage all types of residential rental properties including homes, condos, multiplexes such as duplex and triplexes, and even small apartment buildings. Let us manage your rental properties, so you can enjoy your life! Call us today at (858) 576-2176 and let us save you time, money, and the stress that comes along with managing your own properties.